SUNDAY WORSHIP: 7:45 a.m. and 10:15 a.m.
SUNDAY SCHOOL & BIBLE CLASS: 9:00 a.m. 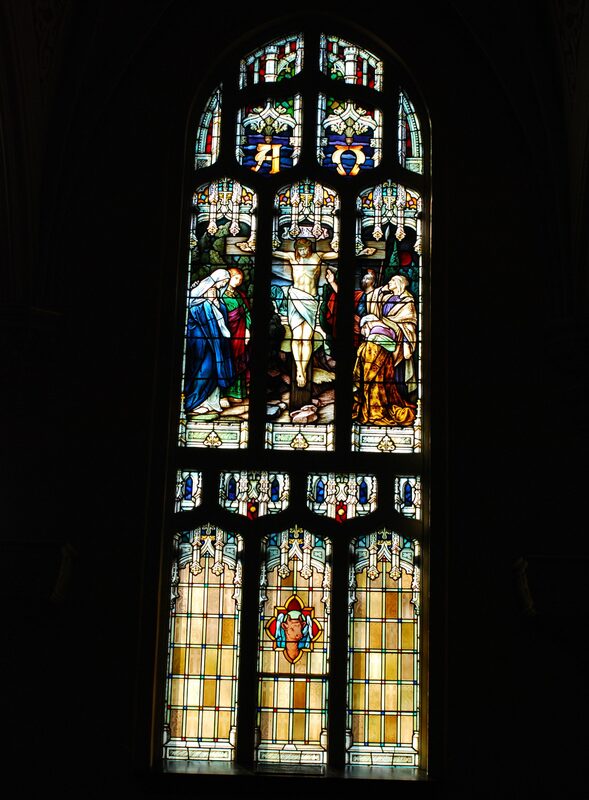 The Lord’s Supper is offered at the 7:45 service on the 1st and 3rd Sundays of the month, and at the 10:15 service on the 2nd and 4th Sundays of the month. It is offered at both services on the 5th Sundays of the month (when there is one), and at all Feast Day services. 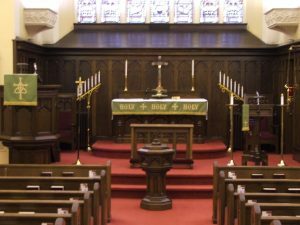 Our Worship is “Lutheran!” Lutheran Worship centers in Christ. Our church follows an annual cycle of readings and responses which unfold God’s eternal plan of salvation in the life, teaching, death, and resurrection of Jesus Christ. We Believe, Teach, and Confess that the true God is the Triune God: Father, Son, and Holy Spirit as revealed in Scripture and confessed in the Creeds of the Church. Jesus Christ, true God and man, reconciled all people to God through His substitutionary life, death on the cross, and resurrection. The Bible is God’s Holy Word, given by inspiration to reveal to man his sin (Law) and God’s plan of salvation in Jesus Christ (Gospel). God has given the Church two sacraments: Holy Baptism and the Lord’s Supper. Through these, the Holy Spirit grants forgiveness of sins and strengthening of faith. Man is saved by God’s grace alone, for Christ’s sake, through faith in the Gospel. We use the Lutheran Service Book for our Orders of Liturgy. Opportunities abound to serve our Lord and His people in Worship! They include: Crucifer (usually the Elder who is serving that day), Torch Bearers, Acolytes (See “The Order of St. Michael’s” below), Deacons, Greeters, and the Ladies who serve the Altar needs. Youth of the Congregation from the age of 10 to 18 serve their Lord by assisting in worship through Acolyte duties and any other duties as assigned by the Pastor. “Acolyte” means “companion” or “one who helps, serves.” St. Michael and all the Angels in the Holy Scriptures serve the Lord. One area of service is in the realm of heavenly Worship. Thus, the name of our “Order” of Acolytes at Emanuel. They serve Pastor and people in Worship. Their training includes an annual Workshop. Their commitment is for at least one month out of the year. The Order of St. Michael’s originated in the Fall of 1996 with the first group of Acolytes installed in this Order in December of 1996. Greeters greet all members and guests of the Congregation as they enter the Church for Sunday morning Worship, distributing Worship bulletins as they do so. They offer assistance to visitors and guests. Members are scheduled for this service on a weekly basis. Emanuel offers a Nursery for both the 7:45 a.m. and 10:15 a.m. Worship services. The Nursery Room (immediately to the rear of the Overflow area) is unstaffed, but always available for parents. 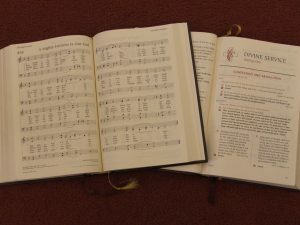 Hymnals and Bulletins/Highlights are available to those who need Braille or Large Print items. Other items provided as needed/requested. See our Music page for information about our ensembles!